Our pre-school classes emphasize the growth of the whole child. The program takes an integrated approach to the development of social and emotional skills, oral language skills, early literacy skills and love of literature, fine and gross motor skills, health and safety awareness, math, science, social studies, technology and the fine arts. Thematic units that integrate religion, art, drama, music, cooking, and science are the basis of the academic program. As part of the school-wide accelerated Math curriculum initiative, the students work in the Kindergarten-level Saxo Math curriculum. Children continue to grow in their awareness of God through their studies of the Beatitudes, Ten Commandments, and Sacraments. The Language Arts curriculum builds upon the primary curriculum and initiates higher thinking skills, increased vocabulary, and reading responses. Using an integrated, cross-curricular approach we focus on comprehension and higher level thinking skills. Both basal readers and novels are used. 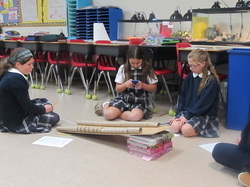 In grades 3-5 students continue to work in a math curriculum that is a year beyond their academic placement, covering concepts such as place value, number sense, computation, geometry, and problem-solving skills. When students complete 5th grade they are prepared to enter the middle school math program that will allow them to complete Algebra by the end of 8th grade. 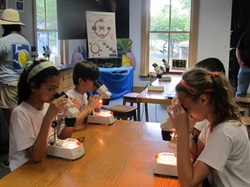 The Science curriculum focuses on life, earth, physical sciences, and the human body. Lessons in economics, landforms, and government at local, state, and national levels in the Social Studies program are enhanced by various field trips. Fifth grade instruction in Language Arts and Math and Science is provided in an instruction block to allow for a broad-based curricular approach. At the end of the fifth-grade year, students are invited to the middle school to meet their prospective teachers and are oriented to the middle school curriculum and routines. 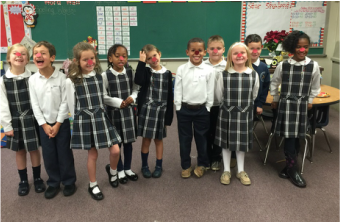 Students spend one class period each day in formal religion classes, in which Catholic values and morality are taught. The Old Testament, New Testament, and a study of the Church form the focus for these Religion classes. The English program focuses on teaching students the writing process, vocabulary enrichment, and grammar. The Literature program is designed to stimulate critical thinking by exposing students to a variety of literary genres. Public speaking, oral presentations, and group projects are included in the curriculum. The Mathematics program teaches students to integrate their pre-algebra and algebra skills with statistics and geometry. Students are grouped into 3 ability levels. The fully equipped science lab allows students to take a hands-on approach to the study of Earth, Life, and Physical Sciences. 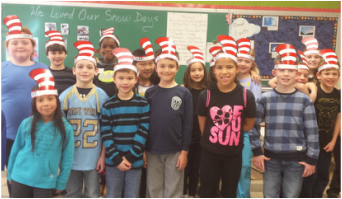 Students are introduced to ancient civilizations, the United States Constitution, and United States history in Social Studies.